The continuing devastation of the world’s tropical rain forest affects us all—spurring climate change, decimating biodiversity, and wrecking our environment’s resiliency. Millions of worried people around the world want to do whatever it takes to save the forest that is left. But halting rain forest destruction means understanding what is driving it. Halting rain forest destruction means understanding what is driving it. 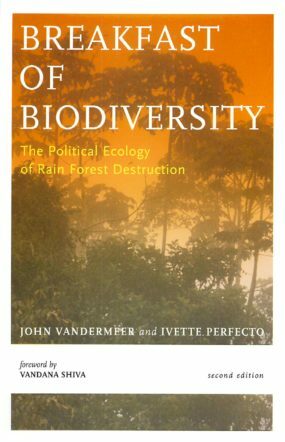 This new, fully updated edition of Breakfast of Biodiversity discusses important new developments in our understanding of rain forest biology and assesses the impacts of a decade of “free” trade on the rain forest and on those who live in and around it. Download the Foreword by Vandana Shiva.